Margaret Atwood’s new novel is so utterly compelling, so prescient, so relevant, so terrifyingly-all-too-likely-to-be-true, that readers may find their view of the world forever changed after reading it. This is Margaret Atwood at the absolute peak of her powers. 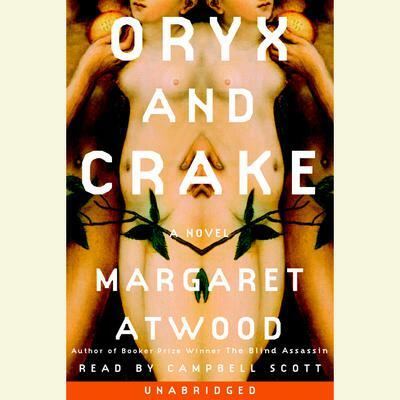 For readers of Oryx and Crake, nothing will ever look the same again. The narrator of Atwood's riveting novel calls himself Snowman. When the story opens, he is sleeping in a tree, wearing an old bedsheet, mourning the loss of his beloved Oryx and his best friend Crake, and slowly starving to death. He searches for supplies in a wasteland where insects proliferate and pigoons and wolvogs ravage the pleeblands, where ordinary people once lived, and the Compounds that sheltered the extraordinary. As he tries to piece together what has taken place, the narrative shifts to decades earlier. How did everything fall apart so quickly? Why is he left with nothing but his haunting memories? Alone except for the green-eyed Children of Crake, who think of him as a kind of monster, he explores the answers to these questions in the double journey he takes - into his own past, and back to Crake's high-tech bubble-dome, where the Paradice Project unfolded and the world came to grief. With breathtaking command of her shocking material, and with her customary sharp wit and dark humour, Atwood projects us into an outlandish yet wholly believable realm populated by characters who will continue to inhabit our dreams long after the last chapter. This is Margaret Atwood at the absolute peak of her powers.